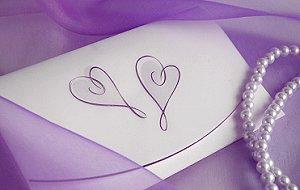 Etiquette for wedding invitations provides helpful guidelines for creating an ideal invitation. From invitation wording to the proper addressing of envelopes, wedding etiquette takes away the questioning of what is socially acceptable. Something to keep in mind is that the invitation should reflect the type of affair your guest will be attending. An informal wedding should have simple invitations, perhaps written by hand. A formal affair should have elegant invitations, perhaps with engraved wording in black and white. Many invitations include the wedding colors in their design, and themed weddings often include a graphic that reflects the theme. Once you've chosen your invitation design, it is time to write the wedding invitation wording. Make sure you double check all of the important information, including spelling and dates, before you order the invites. Include RSVPs with the invitations. The last item on the invitation should be the RSVP date. The initials RSVP are short for the French "Repondez S'il Vous Plait" or simply, "please respond." When these initials appear on the invitation, it means the hosts are asking the guests to let them know of their intentions on or before the indicated date - usually two to four weeks before the wedding. Include the phone number of the person who is to receive the RSVP. Otherwise, include a separate stamped RSVP card for guests to respond by mail. As tempting as it may seem to include information about where the couple is registered for gifts or gift preferences, it is considered very poor etiquette according to tradition to include this type of information in an invitation. Instead, guests may ask about the registry information and ot can be passed along via word-of-mouth. The invitations are usually ordered a month or two before they need to be mailed, depending on your supplier. If you're making the invitations yourself, just be sure they are completed at least six to eight weeks before the wedding. 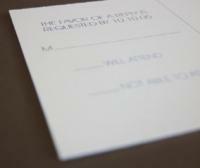 Proper invitation etiquette dictates the envelopes be written out by hand, using ink. While it may be quicker and easier to zip off a couple of hundred labels on the laser printer, this is considered a major faux pas. Even if you have several hundred guests attending, the invitations are to be hand written. According to wedding invitation etiquette, one of the tasks of the maid of honor is to assist in writing out the wedding invitations and stuffing, licking and stamping the envelopes. If addressing the envelopes looks like a daunting task, don't be afraid to enlist this help. It can make for a pleasant afternoon or evening activity, chit chatting with a good friend as you complete this job together. The rules regarding wedding invitation etiquette dictate that invitations aren't sent out too far in advance, but they shouldn't come at the last minute either. You want your guests to have enough time to plan for the wedding and make any necessary travel arrangements. You don't want to send the wedding invitations out too far ahead of time, either. Invitations can be sent out as early as eight weeks and as late as one month. Any later than that would be considered very bad etiquette. Six weeks is about enough time to mail the invitations and receive responses. Once the invitations are in the mail, the only thing left to do is wait for the responses. While everyone will no doubt send their RSVP cards in a timely manner, there's always one or two who either forget to answer or save this until the very last minute. If time is up and all the responses aren't in, the bride or the bride's mother will have to call those guests to be apprised of their intentions. The responses will help you and your caterer get an idea of how many people are coming to help the happy couple celebrate their special day. The next few weeks promise to be a whirlwind of activity as the bride and groom to be take part in all of the last minute details and pre-wedding festivities. Make sure that you don't have to worry about the invitations by following proper etiquette.